James Canter was raised in a family that loved to cook and gather around for the occasion and most of his family worked in his uncle’s seafood restaurant on the Chesapeake Bay in Maryland. He grew up around the many tributaries and brackish marshes of the Chesapeake Bay and the restaurant, and spent many days there while his mother and other family members prepped, cooked, and geared up for nightly service. Canter’s summer babysitter was a culinary graduate from Culinary Institutes of America, and basically the Executive Chef of my Uncle’s Chesapeake Bay seafood restaurant. He was very lucky to have also toured Europe, the West Indies, as well as Iceland, and North Africa. These travels opened his eyes to cultural diversity and all cultures’ common thread, FOOD. 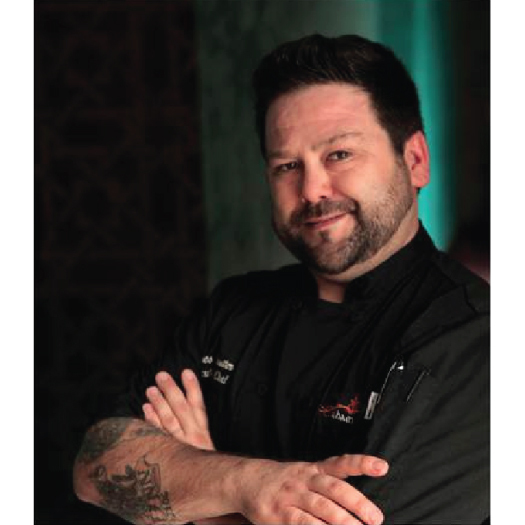 He was always an adventurous diner and interested in cooking as a child and well into his teens, so he decided to attend culinary school after he graduated high school where he was now transplanted to yet another bay town, Tampa/Clearwater Beach, Florida. While doing his apprenticeship at The Omni Hotel in Tampa, Florida he went on a trip to Los Angeles and for the first time on the West coast where his mind was blown with the diverse culture and their respective cuisines, as well as the Californian food philosophy. He was completely hooked. From then on, Canter traveled and went to work cooking, skateboarding and living in San Francisco for many years as well as remote Alaska, Los Angeles, Chicago, Kentucky, remote Montana, Florida, Oregon, Detroit, North Carolina, Colorado and now South Coastal Texas. James, his amazing wife Maureen who has Korean culinary background, their wonderful oldest son Finn and twin boys Jack & Harlan live & work on their little farm, food truck, and restaurants in coastal South Texas where they enjoy all that the culture and bounty offer.